The rhino is one of the largest and most powerful animals on earth, and one of the most ancient. Its origins can be traced back 50 million years when it was know as Paraceratherium, the giant rhinoceros. This monstrous creature weighed nearly 20 tons and roamed the grasslands that ranged from Europe to China. It survived the ravages of the Ice Age, migrated continents, fought against predatory adversaries like the crocodile and prehistoric hyenas, and evolved into what we know as the present day rhinoceros. Human hunting and unstable conditions of habitat have reduced this majestic animal, that once roamed half the earth, to just five broad species found only in pockets of Asia and Africa. Rhinos are in serious danger of going extinct. Poaching of rhinos is on the rise by organized international criminal syndicates. Two rhinos are estimated to be killed by poachers every day in Africa. If rhino poaching is not stopped, African rhinos could be lost forever. Threats to Indian rhinos include expanding human populations, agriculture, and poaching. Dagger handles made from rhino horns are symbols of status and wealth in Arab countries. In Far East countries, rhino horns are sought for alleged medicinal properties. There is no scientific evidence of their medical value, but they continue to be used in traditional Asian medicine – ground into powder to treat a variety of illnesses. Rhino horns have fetched as much as an astonishing $50,000 on the black market. Its value tempts even subsistence farmers and poor herdsmen to be a part of the trade. Poaching gangs have reached great levels of sophistication and use night-vision equipment, veterinary drugs and even helicopters in their hunt for rhinos. There are no longer any northern white rhinos in the wild. There were around 500 of them in the 1970's scattered over northwestern Uganda, northeastern Congo, parts of Central African Republic and on the eastern fringes of Lake Chad. By 1980 their numbers were down to just a paltry 15. Now only three of them are to be found in the Garamba National Park of Democratic Republic of Congo (DRC). The southern white rhinoceros is the biggest of all species, standing almost 6 feet up to its shoulders. Its immense body weighs as much as 5,100 lbs (5 tons). They are pale grayish in color and have two horns, the front one curved and big at the snout of the nose, followed by a very small one behind it. They are found in the Savannah grasslands of South Africa, Namibia and Zimbabwe, and in some measure in the arid expanses of the Kalahari. 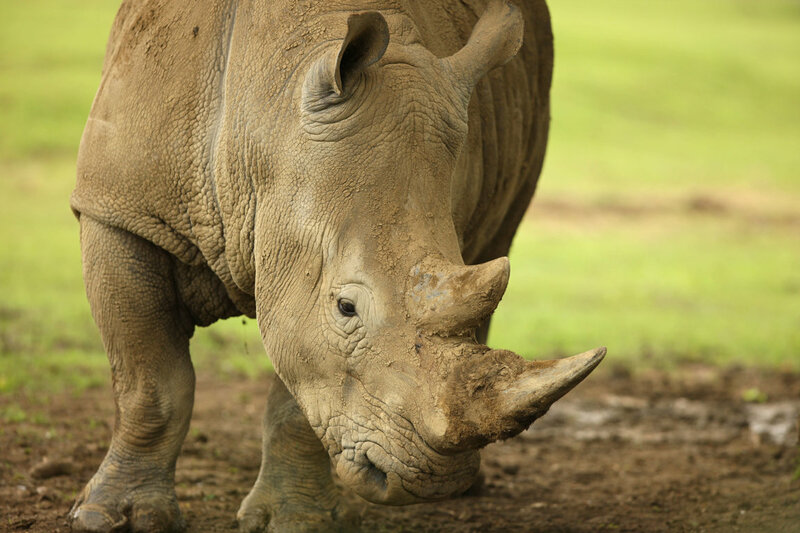 From a position of complete extinction in the early part of the 20th century, the southern white rhinoceros has witnessed a dramatic rise in its numbers thanks to the efforts of conservationists, wildlife agencies, game sanctuary authorities and support of local governments. Presently, the number of these rhinoceros stand at 21,000. Despite now being the only rhinos that are not endangered, a surge of poaching in recent years once again threatens the southern white rhinoceros. Legal hunting also threatens their future, as white rhinos in South Africa and Swaziland were downlisted to Appendix II to allow the export of live rhinos and hunting trophies. The black rhinoceros is another species that is making a comeback from the brink of extinction in the early 1980's to a count of 5,000 today. They are found in East Africa and South Africa. They are smaller in size in comparison to the white rhino. They have an acute sense of smell but very poor eyesight that make them easy targets for poachers. The growing number of rhinoceros in the Southern half of the continent, along with the great demand for horns among the nouveau riche Chinese, has created an incentive for poachers. Cases of poaching in South Africa are up from 15 in 2007, to an alarming 1,200 in 2014. Black rhino horns are in great demand in Vietnam and other South-East Asian countries where they are powdered and used for medicinal purposes. The Indian rhinoceros, or the great one-horned rhino, is the predominant of the two Asian species. They are mostly found in the north-eastern state of Assam in India in reserves like the Kaziranga Wildlife Sanctuary, Manas National Park and half a dozen sanctuaries scattered over the state. The rhinos found in the Kaziranga, Orang and Pobitara inhabit the alluvial flood plains of the river Brahmaputra that flows through the state. There are a little over a hundred of this species in the Jaldapara National Park of the West Bengal state bordering Assam. The sanctuaries of Parsa Wildlife Reserve, Chitwan National Park, Bardia National Park and Shuklaphanta Wildlife Reserve in Nepal hold about 645 of these animals. The male Indian rhinoceros can stand up to a height of 5 feet 8 inches at its shoulders. It weighs up to 4,800 lbs and is much bigger than the female which weighs just 3,500 lbs. It has a thick skin that is grayish brown in color and has a single black-colored horn. Despite its poor eyesight, it has a heightened sense of smell and can become a scary looking animal when it breaks into runs of almost 55 kms per hour. Although massive conservation efforts have resulted in the count of Indian rhinos rising to almost 2,600 from an extinction phase a couple of decades ago, threats in the form of expanding human population pressure, farmlands eating into rhino grasslands, and poaching remain. Organized crime networks are at work catering to the demand for Indian rhino horns, sought for their alleged medicinal values among the affluent Chinese and the rich of the South-East Asian countries. The forest protection personnel of India are not as well equipped as their South African counterparts and are poorly staffed. At the political level, conservation of rhinos is not a priority, and efforts to that end at the grassroots level become difficult. Massive seasonal flooding of the Brahmaputra and its tributaries are turning out to be a major threat to rhinos of Assam. There seems to be no solution in sight. Many of the creatures have drowned or died of sheer hunger, having being displaced from their habitat by raging waters. The Javan rhinoceros is among the most endangered species of animal on earth. Just a century and a half ago, it roamed the wilds of Myanmar, Thailand, Cambodia, Laos, Vietnam and the Indonesian islands of Sumatra and Java. Only 63 of these animals are presently found in the Ujung Kulon national park in the western-most tip of Java, Indonesia. The Java species stand up to 5.5 feet and weigh up to 2,300 lbs. They have a single horn which is the smallest of all species and measures just 25 cms. It is amphibious like the Indian rhino, and spends a considerable amount of time in the shallow swampy waters of the Javan tropical jungles. Although protected by law, and numbers now too few to act as incentive to poachers, other threats exist. The Arenga palm, or Arenga pinnata, that is a native to Indonesia, poses a grave threat to plants which the rhinos of Java survive on. The Arenga palm is an invasive plant that grows and spreads quickly. To counter the threat of real extinction this species is facing, a population is being kept in captivity outside of Ujung Kulon by wildlife conservationists. This may give the endangered Java rhinoceros a last chance of long-term survival. Several rhino species will likely be extinct in just a few decades. The others will follow in less than 100 years. Hunting, animal agriculture, habitat change, and human population growth are taking their toll on these magnificent animals. Without immediate intervention, they will disappear from the Earth causing ecological, social, and economic ramifications. We must act now, before it's too late.